We have been working on plans to bring more transparency to the way we marshal tournaments, and the manner in which we as a kingdom deal with questionable results when they arise. We apologize for the pace of our communications to you. We have talked to Our Earl Marshal and various members of the marshallate. We have talked to Our Order of Chivalry. We have talked to Our kingdom Seneschal and our Ombudsman. We have talked to many of you, and tried to make ourselves available to hear your concerns and advice. When conduct during a tournament is called into question, the tournament can and should be paused or suspended. We should have suspended Our Crown tournament, whether for a few minutes or more, to give the combatants the time to remember themselves and their responsibilities to the kingdom. This option did not occur to Us at the time. We instruct Our marshallate, chivalry and all peers to resolve misunderstandings or issues before the tournament advances. If that leads to delays or temporary suspensions of a tournament, that is appropriate. The populace should not be left in doubt as to the outcome of a bout or tournament, particularly in situations when conduct has deteriorated. We will be adopting a policy of active marshaling similar to one used by the Midrealm, which can be found here, and We encourage you to read it. Our policy will be in place by Birka. This will bring a more disciplined approach with greater transparency to the role of marshaling at Eastern tournaments. 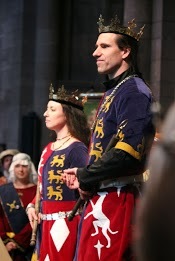 We also plan to amend EK Law at our Birka Curia, to limit the existing exemption in the complaint procedure for Royalty, to specify only the King and Queen. This situation needed a clear process for bringing issues to light and for following through to a resolution. In matters as significant to the kingdom as the succession, We are duly hesitant to set any precedent for the King and Queen overturning the results of their Crown List. This update to Eastern Law will bring us into compliance with Corpora’s recommendation that our kingdom escalate concerns through an internal review process, up to a Grievance Committee, Court of Chivalry or a Court of Courtesy. We are a kingdom of laws, and we must act within the bounds of those laws. We must also redouble our efforts to apply our laws evenly regardless of social station and rank. Rank is awarded for noble efforts, and assigned with the requirement to serve this kingdom and it populace. Thank you for being a kingdom that we are proud to lead.